We review the highs (…and lows) of “Spin the Wheel,” the latest Devidian weekly episode. Then we’ve got a great interview with Jesse Heinig — Trek enthusiast, RPG creator, Fallout developer, and now, Content Designer for Star Trek Online! Plus we have an all new community feedback question, so stay tuned to have your voice heard! – Special ability is really nice for PvP vs. KDF, but lacks in PvE or when solo. Please welcome Jesse Heinig to STOked! Dedicated to Xavier Blackwood (aka Chris) – a fan of STOked that recently suffered a seizure and is now in a coma. He’s been a fan of our show since the beta days, but is now in a position of only having a 30% chance of making a full recovery. We wish him the best, and hope he beats those odds. 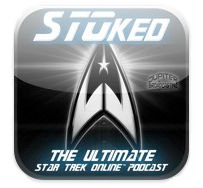 Send us the absolute best STO-related URL that you think nobody’s heard about!